‘Rural Ireland’ has the ability to become an economically powerful region in its own right, according to the director of one of the region’s key funding agencies which covers the Midlands region. With its key strengths of people, energy and resources connected, David Minton, director of the Northern & Western Regional Assembly (NWRA) believes that ‘Rural Ireland’ could become a force to be reckoned with. Instead of ushering in its demise, he says, we should see Rural Ireland as a region with huge untapped potential and the capacity to lead the emergence of vibrant new economies. Mr. Minton, who is head of NWRA, one of the national bodies which administers European funding in Ireland, was speaking at the launch of ONE Region: ONE Vision. His comments come as the debate about the future of rural Ireland rages, with issues such as possible cuts to transport links, poor broadband connectivity and the closure of vital services that connect communities in rural Ireland. 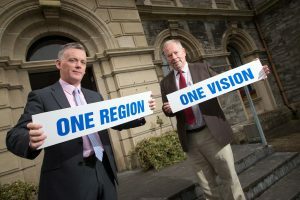 The ONE Region: ONE Vision conference, which will be held at The Model in Sligo on December 8, will bring together key players in Rural Ireland in order to plot how the region can kick-on and build a lasting recovery. It will explore the unique possibilities on offer to innovators and job creators in rural communities, discussing how changing conditions could enhance what’s already one of the most sensational places to live on the continent of Europe. “Rural Ireland is far from dead – in fact it’s changing, adapting, reshaping – it has responded to international trends and survived,” says Mr. Minton. Ireland needs rural Ireland, believes Minton. All we have to do is connect its strengths. Speakers include RTÉ broadcaster Richard Curran, who hosted TV’s ‘Battle for Rural Ireland’, the ESRI’s Chief economist Dr. Edgar Morgenroth, and broadcaster and environmentalist Duncan Stewart and Oliver Daniels of the Insight Centre. The conference will throw open the doors of possibility and answer challenging questions. There will be a focus on what more can be done to maintain rural communities, to build a sustainable future for young people, to create the conditions to enable wealth generation in rural Ireland. Minton says these and other questions will be tackled. “How do we promote our region’s creativity, space, resources and energy? How do we turn possibilities into reality?” he added. ONE Region: One Vision will take place at The Model, in Sligo, on December 8 from 1pm to 5pm. Places can be booked at http://nwra.ie/conference/.